I just want to make sure that if I were to be asked to write something out in Hiragana, it would be easy to understand. Some kana are definitely unbalanced, notably そ, ね, れ, わ. A few other characters have curves that aren't in right places too, but they're matter of practicing, I guess. You try keeping writing in squares, which is a right attitude. However, fitting the square doesn't mean filling the square; some kana have to be oblong relative to the square frame. Some kana you see in textbook might have "hooks", but it's not what meant to be reproduced when you write yourself, especially with ball-point pen, as they are "trace" of pen that kept for stylistic reason. If you write at a fast pace, they do appear in your writing, though not needed to be awarely copied. Finally, I have to say that your handwriting apparently seems non-native (besides well or badly shaped), but that may be because you haven't seen how they actually write. 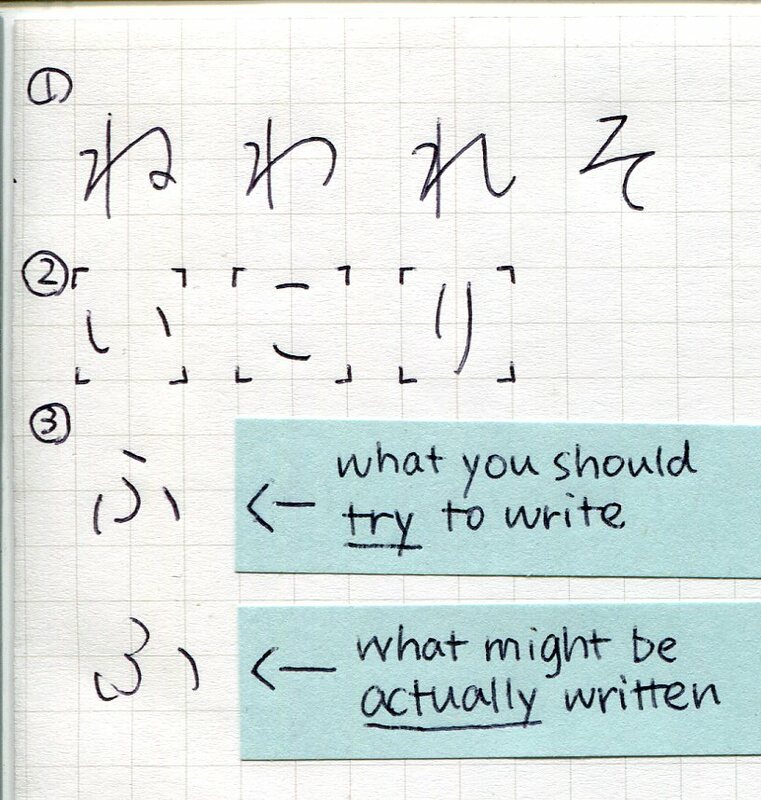 Googling "手書き" (handwriting) in Japanese will provide you tons of living examples. Your Hiragana is fine and legible. You write Japanese characters better than an expatriate I know who speaks Japanese pretty well. However your ね,れ,わ, all of which are combination of a straight line and a curved line, look somewhat awkward and constrained, because the head of vertical lines are all tilted to left. It should be drawn straight down as you see in the printed characters. そ lacks the balance. It's top-heavy, and easily confused with a deformed た. The ノ line of ゆ should be placed in the exact center of the character, keeping a good balance. Your hiragana is probably much more legible than when I was at third grade in Japan. Your ね、れ、ゆ、わ、そ needs a bit of work on overall balance as the right side tend to be squished a bit. For your そ、the bottom curved stroke got squished because you made the top portion proportionately too large. Never the less, I could probably read a whole book in your writing with decent comfort. Not the answer you're looking for? Browse other questions tagged hiragana handwriting or ask your own question. Why some tutorials teach writing Japanese numbers with Hiragana when they are actually written with Katakana (as on-yomi) in dictionaries? Is it okay to switch from kanji to hiragana in a sentence? 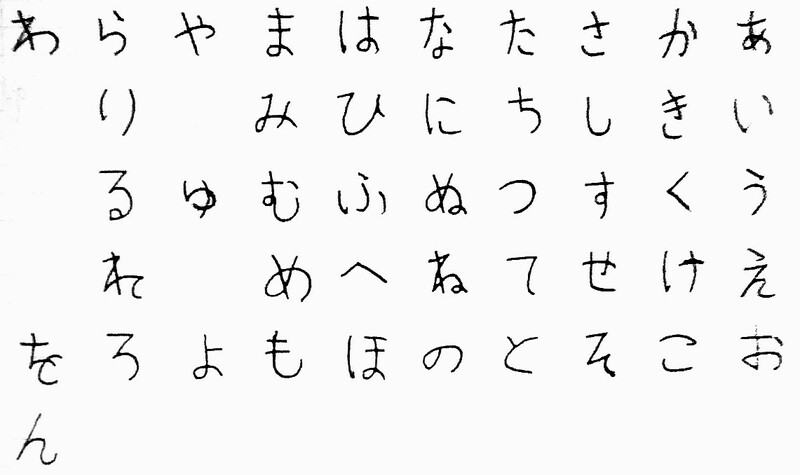 What is a good strategy to make sure my Hiragana proportions are correct? What is the diffrence between hiragana and katakana? Is hiragana equal to lower case and katakana equal to upper case when comparing Japanese and western writing systems?